I have LLama 4x4 extended lines on my RRC with QT weekender kit on the front end. I KNOW that I can articulate more with the right shocks at the front, but the brake lines are too short at the moment. and as I had to cut the inner wing anyway and lose the inner wing mount for the brake lines as a result I was thinking about replacing from the master cylinder all the way to the calipers on both sides. I am thinking about this because I had to bend the copper ones all over the place to have them at the mounting point I wanted. Actually writing this down has given me another idea to have copper again but shortened to finish on top of the inner wing and go braided from there. 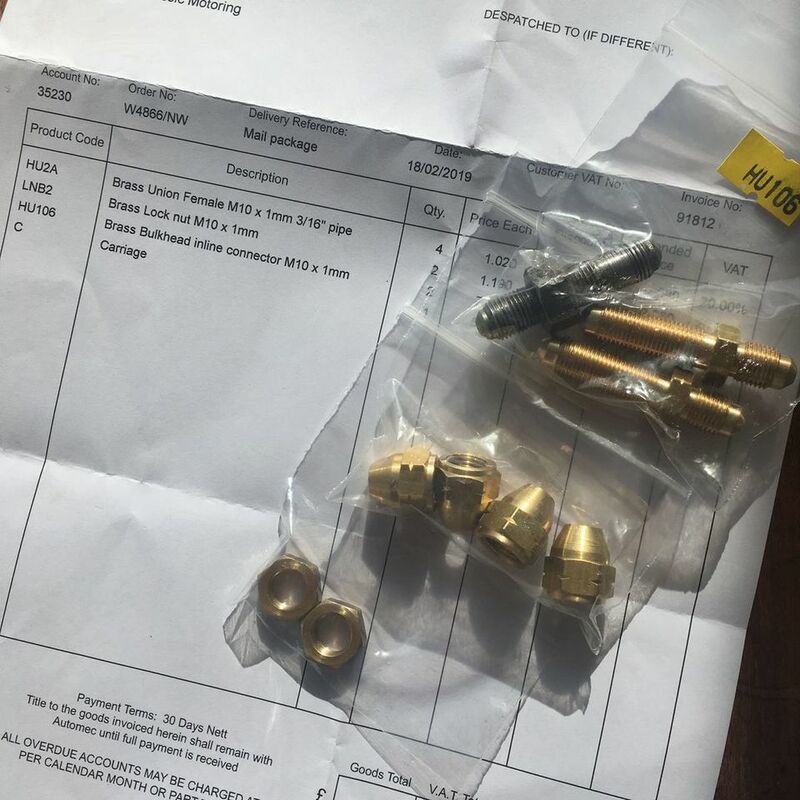 The question is, as I was going to order from goodridge directly, what thread and size are the master cylinder fittings, the end fittings in the inner wing, and the fittings on the end of the calipers? I have some +4" stainless goodridge front hoses that are brand new. What length do have have current? Talk to David at Llama. I beleive he will make hoses to whatever length you need. He is also on this Forum so maybe a forum discount as well. The black covers have cracked, they aren't leaking but I'm not sure that they would get past the MOT man. What i was trying to get away from, was asking someone else to do the job. Goodridge now do kits that can be reassembled, and I fancied one of them. Also, as I am sure some people DO know what the ends are, even if commercially they don't want to say as it would hurt their business. So..... anyone want to tell? 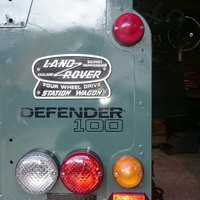 On My Discovery (1996) they are M10x1 threads at the caliper and inner wing fitting, I can't say about the master cylinder as I have not had to change one yet.. Mine has ABS by the way. 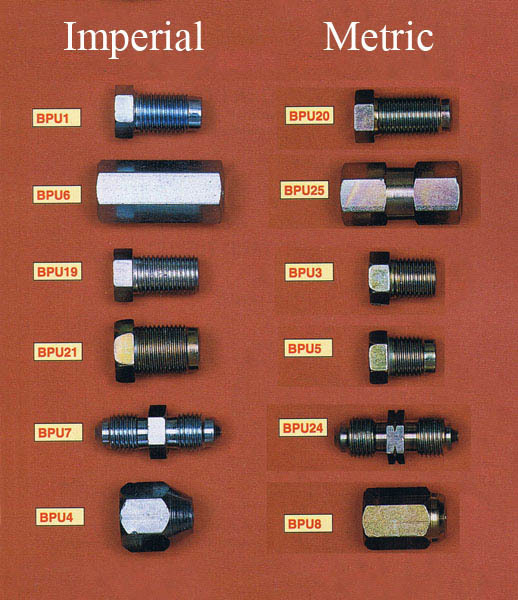 "After seeing a lot of debate on here about Imperial & Metric brake pipes on Land Rovers, I have compiled a pic of the different types used for 3/16” piping for your information. * Metric - M10 x 1mm"
I have gone off the idea of going straight from the master cylinder anyway. Going to mount high up on the inner wing. A mate said that he has got a brake line flaring tool that I can borrow. The braided lines you make up yourself are very good but can be a bit of a fiddle to do. You need a 'Dremel' with a cutting disc. Make sure you put the outer part of the fitting onto the line before you cut it to length otherwise the braid splays and you can't get it on. When you cut the line wrap it very tight with a couple of turns of masking tape then using the 'Dremel' very slowly cut through the middle of the tape so that the tape prevents both sides of the cut splaying. Work your way all around the cut gently cutting the braid but not the inner. If you try and cut right through the cutter will snag on the braid and splay it out making your life a misery. They are a fiddle - but it isn't difficult. Wrapping with with masking tape is a good tip but a 'Dremel', while very useful, is not essential as the braided hose can be cut with a hacksaw. One thing to be ware of is where the brake line will flex to as the axle moves up, its got to go some where and the longer it is then the more difficult it is to keep it away from the tyres. Braided lines maye be tough, but if left to rub agains a tyre then they don't last too long. Fortunately the time I've seen that happen it was only a near miss. Just had a thought - would the applications of one of the more flexible superglues around the area of the proposed cut do the job of keeping the strands together? The pic below is the union on an RRC found under both front footwells going through a floor support. It's [flipping £17!] fitted by means of the integral hex on one side and a hex nut on the other, to clamp through the panel. Thing is I can't get an answer from any of the suppliers, it's never pictured with the nut, does anyone know if the nut is supplied? I ask because I think it's a fine thread. To round this off, I got my fittings from Automec. Less than half the price from a LR specialist. Fantastic. 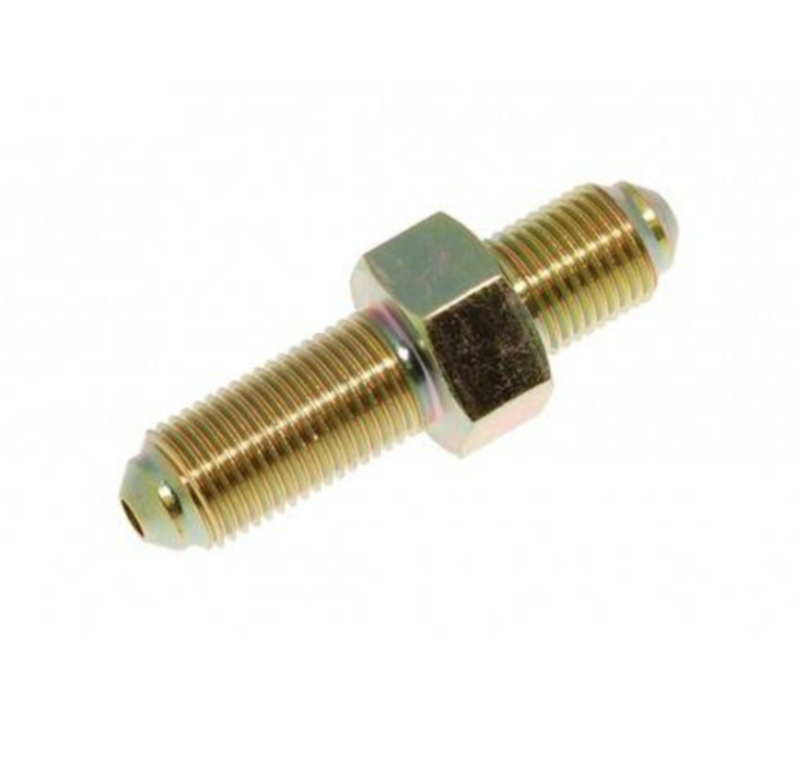 For anyone [like me] who might be having a hard time figuring out what size the fitting is, it's M10 x 1mm and the Automec product code is HU106, and the locking nut is LNB2. Good news! Will they be making an appearance in the next episode? Anything's possible, having said that I spent the last two days patching three doors.